Darling Harbour can be a bit of a tourist trap where you often pay high prices for a meal. Yet there are some establishments that serve a great hearty meal that won't break the bank and Pontoon is one of them. 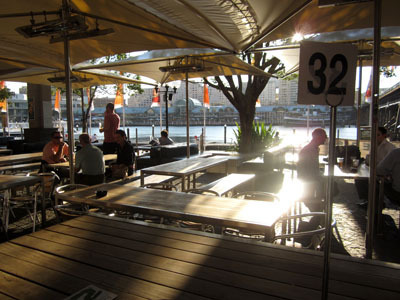 Located on the eastern side of Darling Harbour in Cockle Bay Wharf, it attracts glorious sunsets and fantastic views for those lazy afternoon meals. Sunset view across Darling Harbour, perfect for a lazy afternoon meal. Feeling a little peckish after walking around Sydney one day, we really didn't want to pull out the credit card to fill our hunger pangs. Most establishments were way out of the price range we were prepared to pay. And a meal in a rather ordinary fast food outlet surrounded by hordes of people was out of the question also. What we wanted today was a great relaxed atmosphere where we could take in the stunning views sipping on a glass of wine with a well priced meal to round off our fun day out. Pontoon most certainly fitted the bill on all counts. 'Sunset over Kebabs' Marinated Spiced Lamb Kebabs and my glass of wine. Pontoon has a massive expanse of outdoor seating covered by interconnecting umbrellas to keep the heat at bay during summer and equipped with heaters to keep you warm during winter. Perfect for the ultimate outdoor dining to enjoy the fresh air. Now for those hearty inexpensive meals. Their menu offers eight wel- plated, simple and filling meals. 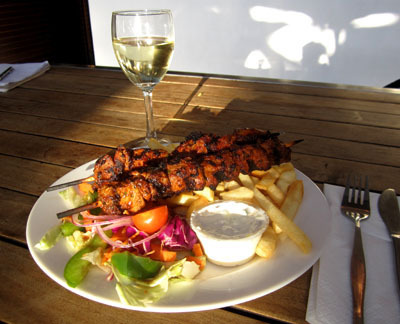 I opted for the marinated Lamb Kebabs coated in paprika and other delicious spices, served with a small tub of tzatziki, plenty of crispy chips and a delightful salad with a light balsamic dressing @ $12.90. 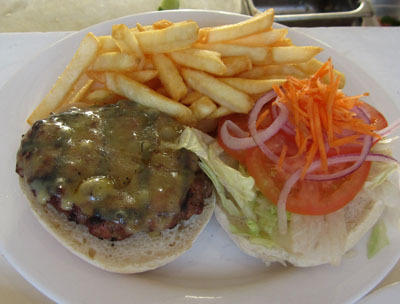 Open Beef Burger, enough to feed the hungriest appetite. 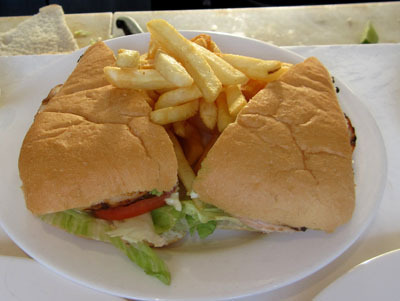 One friend ordered the open style Beef Burger with melted cheese, salad and chips @ $9.90 and my other friend ordered their rather large Chicken Sandwich made with a grilled, moist chicken breast, mayonnaise, salad and chips. @11.90. The portions were quite generous and you could certainly share any of these meals between 2 children or a friend if your were only a little peckish. Grilled Chicken Sandwich, enough for two to share. I know we said we were only a little hungry. However it was in late afternoon where the lunch crowds had left, leaving us with plenty of space to choose a table and watch the sunset over the water. So we decided to make this our early dinner. We leisurely ate our meals chatting over a glass of wine and watched the golden, glowing sunset over the water and buildings. It has such a great vibe, encouraging you to just kick back and relax. Later we ordered a large bowl of wedges to nibble on as we lingered throughout the rest of the afternoon. 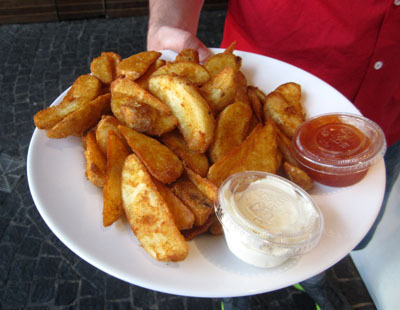 Big bowl of potato wedges to nibble with your drinks. There are eight bar-style meals ranging from $7.90 to $12.90 and five generous salad meals from $9.90 to $11.90 and of course the Seasoned Spicy Wedges served with chilli and sour cream @ $8.90, as well as single servings of chips to snack on. Pontoon has a fully stocked bar with a pretty good wine list consisting of sparkling, whites, light reds and bold reds averaging $7.90 per glass. or $35 per bottle. Meals are served from 11am and continue through to the wee small hours the following morning, some nights until 3am when the bar closes. Bar and eatery - avoiding the lunch and dinner crowds! Pontoon is definitely a great place to enjoy a relaxing, inexpensive meal with friends on those days when you don't want to damage your credit card. 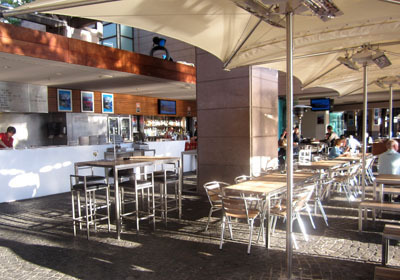 It's also fabulous for families as the bar is an open, outdoor space and can accommodate children quite easily. A great eatery destination for tourists who need to watch their dollars in this expensive part of Sydney. As the sun sets on Thursday, Friday and Saturday nights, Club Night begins with a resident DJ or live band providing you with some cruisy and dance music to get your motors running on their dance floor. Especially great if you are not in the under 25 age group. Seagull playing the waiting game from a sympathetic customer. Oh, a little fun word of warning. 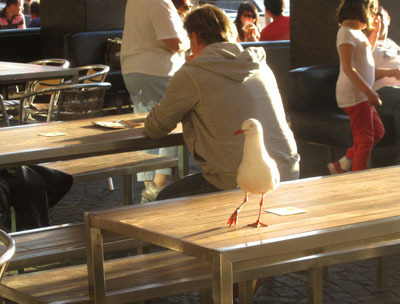 When the staff bring your meals to your table, they advise you to keep an eye on the seagulls and your food. I was half expecting a scene from an Alfred Hitchcock movie, having to guard my meal with my life. The seagulls however, are rather quite polite and stand at a distance waiting for you to throw them a morsel or two. This one even limps on one foot anticipating a sympathetic act of kindness! When: Opens 11am to around 3am.